My husband grew up in a small town. There are supposedly 2000 residents still living in it, but I believe that they are counting chickens and pets. It's a great small town and I love visiting my in-laws at least twice a year. My boys go up and fish, take hikes in the forest and generally love every minute of their stay. There is literally one stop light in the whole town and my in-laws know everyone by name. My dad grew up in an even smaller town (there was no stop sign at all), so small town life was something I grew up surrounded by. One of my favorite aspects is the casserole. Every time someone is sick or dies my mother-in-law makes a covered dish. My husband jokes that the way that you can spot a Methodist is by the covered dish socials. She makes a mean casserole and I love her cooking. It is also a long standing joke in my household that when my mother-in-law calls and asks me if my husband knows such and such that that person is either ill or dead. Since most people in the town are getting older (like the whole state of WV) there are a lot more casseroles to be made and a lot more phone calls. There is something very comforting about sitting around in my in-laws kitchen while my mother-in-law cooks. The town looks and feels like it could of stepped right out of a 1950's sitcom, it feels like home. It's also one of the many reasons that I love my state. Homemade bread is one food that instantly makes me feel the same way that small town WV does, comforted and perfect. 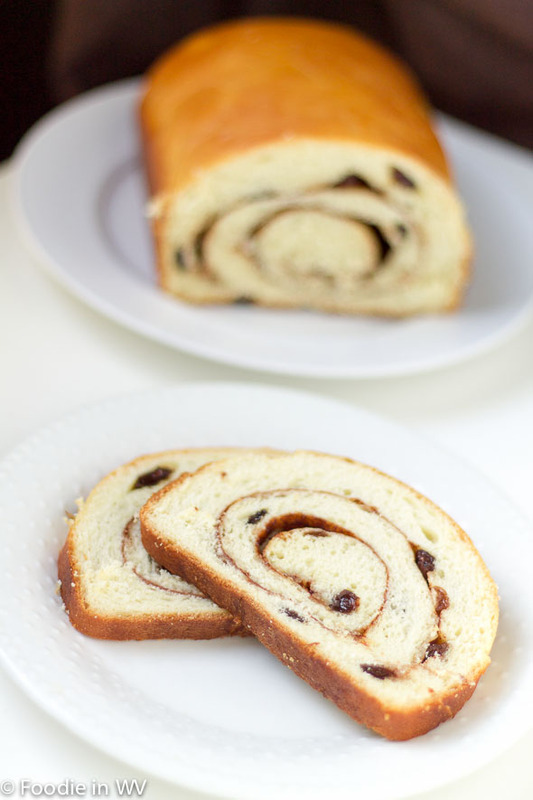 This week I tried a new recipe for Cinnamon Swirl Raisin Bread from the Betty Crocker website. This recipe has 13 ingredients. It takes 3 hours and 10 minutes of total time, 35 minutes of which is active and makes 16 servings (per loaf). Since I make bread every week I take the easy way out and combine all the ingredients in my mixer. After they have been combined I take out the dough and knead it by hand for 6 minutes. I do not wait for the yeast to proof. I know that my yeast is fine so I add the yeast to the dry ingredients on the bottom of the bowl and then add the wet ingredients on top. I allow the egg to come to room temp before adding so it doesn't shock the yeast. Rising times are really relative. My kitchen always takes at least 2 hours for a good rise, even in the summer. Don't think that if your dough has not come over the top of the loaf pan in an hour that you did anything wrong, it just needs longer to rise. Make sure that it has just come to the top of the pan and not puffed over or your bread tops will fall during baking. With breads with egg they will rise over the top nicely when placed in the oven. The tops of this bread turned out beautiful. It rose very nicely in the oven and the dough was very easy to work with. I only had to add a little under 6 cups of flour and the dough was very smooth, which was nice. So many dough recipes have a tough dough to work with before kneading, but this bread was an easy to work with and simple to complete. Plus since it makes two loaves it was enough for three days. You can also freeze the second loaf for later use, just make sure to wrap it well in butcher paper. For the recipe go to Cinnamon Swirl Bread. Your bread looks good. I am not eating bread anymore, though. If it makes you feel better I can't eat it either because of the gluten :) Gluten free bread just isn't the same! Ann su receta resultó muy hermosa y deliciosa realmente espectacular con pasas,abrazos y saludos. The raisins are the best part :) Thanks for the sweet comments! I have lived in a very large city and now a much smaller one :) I love both, there are positive and negatives to each. I agree about casseroles, love them! I LOL at the the phone call asking about such and such means that they're ill or dead. That sounds just like my mom. She lives on the island so everyone knows everyone and I know as soon as she asks me if I remember someone its for the same reason. :) That bread looks delicious. I love cinnamon raisin bread and bagels. Glad that I'm not the only one with the phone calls :) My husband and I joke about it all the time (in a good way)! So do my kids, they love them! Homemade bread is the BEST! Your cinnamon rolls look marvelous! I agree, it's great right out of the oven! Homemade bread is my favorite - and what's better than warm cinnamon bread right out of the oven. Yum! So true, especially with a slab of butter! Thanks :) The dough was very easy to work with too! This looks delicious. And I'm torn between small town/big city. I like both. I like both too :) They both have great and not so great things about them! I love casseroles too! I really like tuna casserole and I wish my family did too because I crave it sometimes. This bread looks wonderful, I will have to add it to my list! I like tuna casserole also, but my husband hates it! This could make me go right back to being a carb monster! My mom makes a mean string bean casserole with the fried onion strings on top. So good. This bread looks amazing! It would be perfect with my coffee tomorrow - great picture! Toast and coffee do seem to go hand in hand! I miss the mild winter weather, it gets much colder here :) I love finding other people that lived in Seattle and then moved, everyone has great stories! This bread really is easy I promise. I make bread at least once a week. I was diagnosed with celiacs last year so I can no longer eat it, but I still make it for my boys and husband :) I have made a number of different bread combos depending on what I have on hand. Some of the best in the summer come from combinations that people would normally not think about like heirloom tomatoes or basil. For swirl bread I like using currants since they are smaller than raisins, dates are also nice chopped finely. Pecans and currants are a popular combination with my two boys, same with hazelnuts. Thanks for stopping by and leaving a comment. I love meeting new people that bake and cook :) Stop by again soon!